The 2016 housing market continues to follow the 2015 trend, showing more closed sales and higher median & average prices for single family homes. The reduction in Pending Home sales may be attributed to both the lower amount of homes on the market, and the holiday season combined with winter snow events preventing out-of-state buyers from moving forward on a home purchase. This reasoning is also supported by a 29.2% reduction in closed sales from January 2016 over December 2015. The current single-family home inventory is at 4.3 months, maintaining a seller’s market. There are 8.7% less homes on the market than last year, and the number of new listings in January dropped by 2.4%. Home sellers are receiving on average 93.3% of their list price. The decrease in short-sale & foreclosure inventories continues, with 18.4% less foreclosures and 5.4% less short-sales on the market compared to January 2015. However, the closing for these transactions have higher sales prices than last year, with a median sale price for foreclosures at $222,000, a 41.9% increase. The median price for short-sales has increased by 23.8% at $252,000. These numbers are catching up to the conventional median price for traditional homes sales at $310,000. The Broward condominium market is not improving. The good news is there are 5% more condominium properties on the market this year and it’s a buyer’s market. However, they are taking 40% longer to sell with 69 Median Days on Market. With more available property, buyers are taking their time finding the right match. 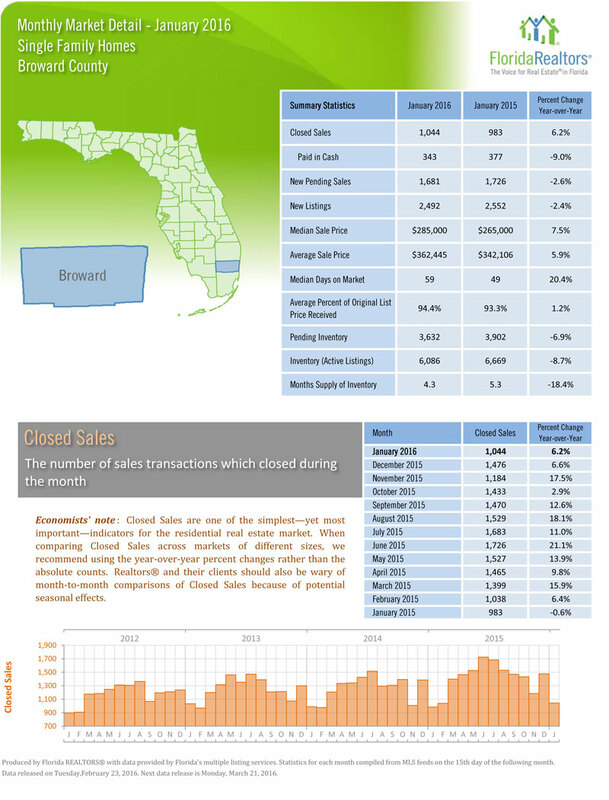 Traditional condo sales in Broward have improved with 7.9% more closings in January 2016 over 2015, but foreclosure and short-sales of condos have dropped 40% and 34% respectively. When relating to market conditions, this is a positive trend as the range of condominiums with stable ownership and financials are increasing, making it easier for lenders to finance these properties. But at this time buyers are still required to place between 20-30% as a down payment in the majority of situations. 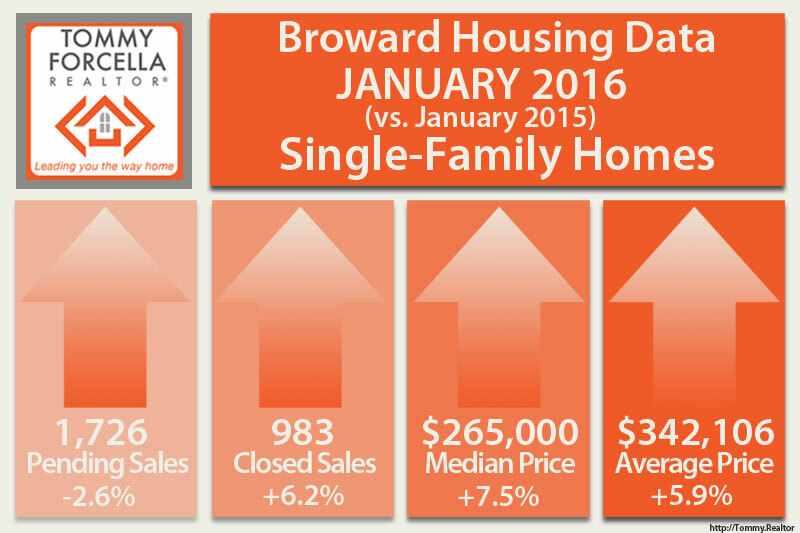 You can read and download the January 2016 Broward Market Statistics for FREE.